This week I decided to pull out my Halloween quilt UFO. I had planned on getting this done before Fall....but what can I say? I'm motivated by a deadline. I started this one last October and was too late for Halloween, but not this year! I paired Tula Pink's Nightshade line with Kona Snow and Oakshott Cotton from the Lipari colorway. You can read more about the Oakshotts here. 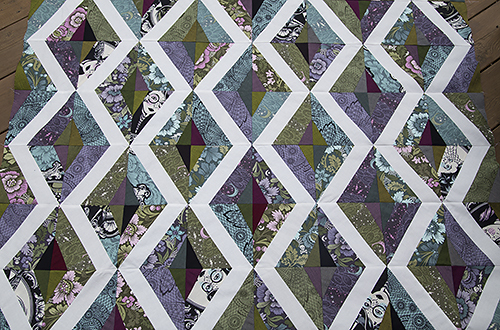 I'm using my Prism quilt pattern. It's a really fun, quick paper pieced design. I can't wait to get it quilted and on my couch!